The punitive prison currently dominates the practice of Anglo-American criminal justice, stigmatising its victims as perpetual 'offenders' and failing to change a majority of them for the better. Books of academic 'readings' sometimes profess neutrality over the controversies they invigilate. Offenders or Citizens? sits on no such fences, its pages reflect the fiercely partisan nature of the contest between rehabilitation and punishment. Probation, social work, youth justice, law, corrections, criminology, journalism, philosophy, politics, popular culture, psychology, anthropology, and sociology – the voices of participants, professionals, and writers from many realms are all represented in this lively selection. Its aim - to stimulate and furnish a debate about the proper place of rehabilitation within a plural, morally defensible, and effective response to crime. 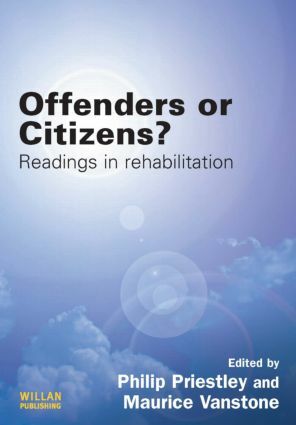 This book will be essential reading for both students and practitioners within criminal justice, who have an interest in the rehabilitation of convicted individuals, and providing an essential broader context to the 'what works' debate. ‘Punish and rehabilitate’ – do they mean us? What works in prisoner reentry? Rehabilitation: headline or footnote in the new penal policy?